It is critical to minimize the time it takes an organization to detect a threat and develop an appropriate response. An effective response needs to eliminate the threat and incorporate preventive security measures. An organization needs to stay alert to signs of new threats, ensure prevention measures are in place, monitor new endpoints and configuration changes, and close the gap between threat detection and response. Effective endpoint threat detection and response requires a variety of tools, knowledge, and expertise. SanerNow Endpoint Threat Detection and Response (EDR) is a cloud-delivered service that detects ongoing attacks within the network and thwarts ongoing attacks by blocking or containing the attack. SanerNow uses in-house developed rules and behavioral patterns to detect Indicators of Attack (IoA) and Indicators of Compromise (IoC). Visibility into endpoints is the 'blind spot'. Get Visibility. Detect an ongoing attack, take immediate action to neutralize the attack. Detect elusive risks, threats and anomalous activity unique to your organization and reduce risk posture. Through unique system probing capabilities, run queries and get results in seconds. The SanerNow platform delivers automated and on-demand responses that return endpoints to a trusted state. An array of response options block or contain attacks. Validate or dismiss security events as they happen to eliminate the chance of missing critical alerts that can cause a potential breach. 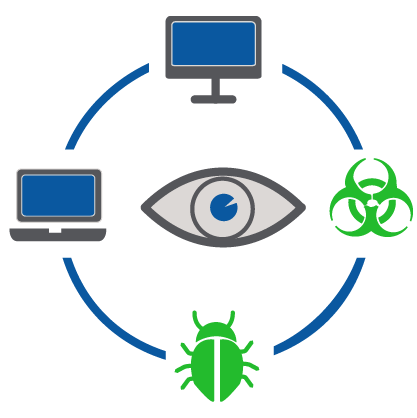 SanerNow speeds detection of new malware threats by providing unmatched visibility into an organization's endpoints both on and off its network.